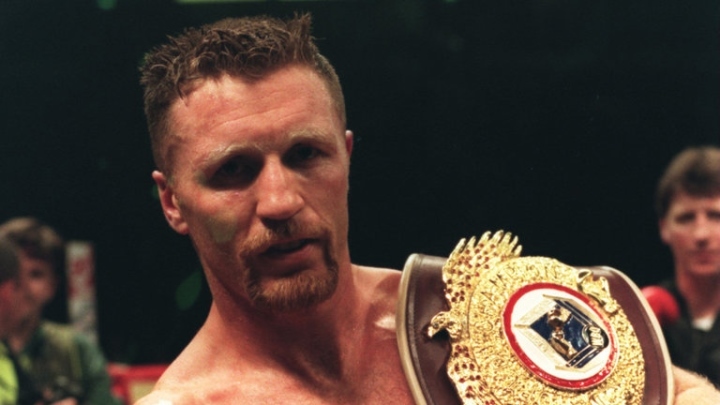 Steve Collins' showdown with Nigel Benn appears to be getting closer. The 53-year-old Irishman said on Tuesday he has been issued with a licence to box. Collins, who ended Benn's career after stopping the 'Dark Destroyer' in two successive fights in 1996, has been interested in returning to the ring since 2014 when he told Sky Sports that he would welcome a fight with either Roy Jones Jr. or Joe Calzaghe. However, neither of those fights materialised and Collins was approached by Benn this summer about a third contest between the pair. “Nigel's camp are still serious about going ahead with it,” Collins told talkSPORT when he was asked about the fight. Collins, the only Irish fighter in history to hold world titles at two different weights, was brought to the attention of ‘Dark Destroyer’ Benn after his hope to renew his rivalry with Chris Eubank quickly faded. No details regarding the body with which Collins has been licensed have been revealed. During the summer, Collins stated to BBC Sport: "It's just about money, a payday which will allow me to buy some more land. I have no problem with Nigel. I have a lot of respect. I like him. I get medicals every year and the most impressive part is my MRI. 'Excellent' was how the neurosurgeon described it. I'm very healthy and very fit." [QUOTE=KillaCamNZ;18148086]Yep, the same one. Which makes this all the more sad. [/QUOTE] I think that's going too far. Really. I say even in advanced age, Collins sparks Jones inside of 9. [QUOTE=revelated;18147950]The same Roy Jones that got brutally knocked out by a bum in Enzo Macaranelli? That Roy Jones? [/QUOTE] Yep, the same one. Which makes this all the more sad.